Elizabeth Lawrence advocated their use in edging a bed of early daffodils! Fragrant tiny nodding yellow flowers bloom in early spring. A much-loved English wildflower which was once gathered by the armful to make wine. 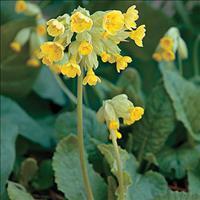 Cowslip petals in sugar were recommended as an excellent and refreshing salad. 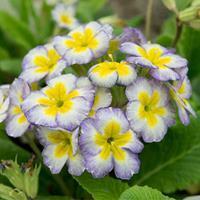 It spreads to form large cheerful-looking clumps. Listed in an 1827 seed catalog. Florence Bellis, inspired originator of so many beautiful primroses, started with a mere $5 worth of primrose seeds in 1935 and built by hand the renowned Barnhaven Primrose selections. We are proud to offer the descendants of her breeding efforts. 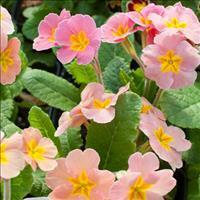 This hardy, easy variety is offered as a mix of various shades of coral, maize, pink, apricot, and orange. We adore it and it deserves your love too! 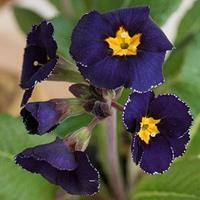 An unexpected addition to the primrose palette, the velvety rich, deeply colored petals resemble a starry late night sky with their stippled whtie edges, all surrounding a sunny yellow center. 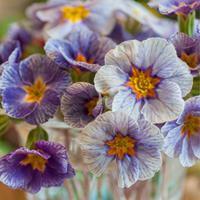 Like a cloud in the spring sky, this lovely flower has lavender-blue edges on a white ground pierced with sunny yellow in the centers. Each plant has a unique combination of these hues. 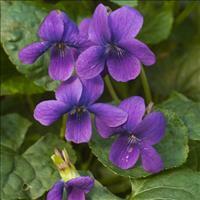 Wonderful in pots sunny cold room, where it may bloom as early as February, or in a woodland setting. Barnhaven Primroses selected this lovely dusky hued charmer from the historic ‘Sutton’s Blue’ in 1948, refining its color palette until it was fit for release in 1957. Described by the breeder as “veined and striped like Japanese irises”, it has deep blue to purple to lavender blue striped flowers and dark green textured leaves in low rosettes. Humus rich, welldrained soil and afternoon shade best. Variable color.